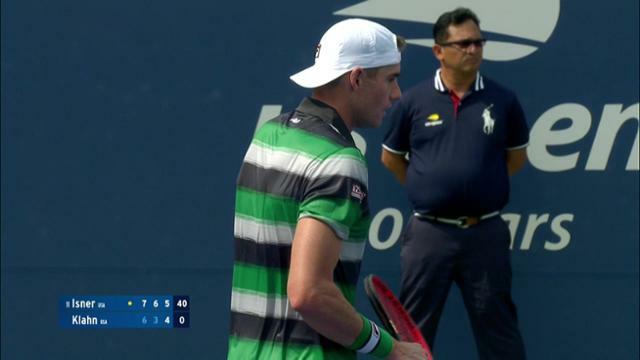 WHAT HAPPENED: John Isner has to be used to sweaty-palm and soaked-towel days in Flushing Meadows, this his 12th US Open. The top American handled the heat with veteran poise during his opener on Monday afternoon, beating American wild card Bradley Klahn 7-6, 6-3, 6-4 in Grandstand. “I'm very happy to win in straight sets. It's pretty muggy out here. The conditions are not easy to play in,” Isner said. The 11th seed is looking to make his deepest run yet in New York, having posted his best Grand Slam result in July at Wimbledon. The 33-year-old reached his first Grand Slam semifinal before falling to Kevin Anderson 26-24 in the fifth set. Isner hasn't been to the second week in New York, though, since 2015, when he reached the fourth round for the second time (2009). He reached the quarterfinal here in 2011. SEE ALSO: Newly married and with a baby on the way, John Isner is playing relaxed tennis and enjoying a stellar season. The 6'10” ace machine has to be thinking this is his year in Queens. He won his first ATP Masters 1000 title in April, beating Alexander Zverev for the Miami title. After Wimbledon, Isner soared to a career-high No. 8, and he followed up his SW19 semifinal with his fifth Atlanta title last month. Off the court, life has never been better. He and his new bride, Madison McKinley, who married in December, are expecting their first child, a baby girl, on September 22. Isner and Klahn, both former collegiate greats, traded holds throughout the first set before Isner seized his moments in the tiebreak, returning aggressively and charging forward behind backhands down the line. He raced to a 5-0 lead in the second set before serving it out in the ninth game. A break in the third game of the final set all but sealed it for Isner, who will next meet Chile's Nicolas Jarry, a 7-6, 4-6, 6-1, 7-5 winner against Peter Gojowczyk of Germany. WHAT IT MEANS:The 28-year-old Klahn was on the rise eight years ago, when the reigning NCAA singles champion earned a wild card and made his tour-level debut at the 2010 US Open. Four years later, Klahn was ranked No. 63 and climbing. Two back surgeries, however, derailed his career and forced him to miss 21 months, from February 2015 to November 2016. The Stanford Cardinal grad contemplated retiring. But Klahn came back. He earned his fifth US Open main-draw appearance by winning the US Open Wild Card Challenge, thanks to an ATP Challenger Tour title in Gatineau and a first-round win against Spain's David Ferrer in Toronto. Klahn is projected to crack the Top 90 again after the US Open. "He's one of the hardest workers I've ever seen," Isner said. MATCH POINT:Isner's best tennis has come in the U.S. He's won 12 of his 14 titles in America, and eight of those 12 have been on hard courts. Can Isner make it back-to-back Grand Slam semifinals? August 27, 2018 - Mischa Zverev in action against Taylor Fritz at the 2018 US Open. August 27, 2018 - Stan Wawrinka serves the first ball against Grigor Dimitrov at the 2018 US Open. August 27, 2018 - Stan Wawrinka reacts to beating Grigor Dimitrov at the 2018 US Open.